Guess The Words for Android, available on the Google Play store, is a decent free game that provides something to really test the old grey matter. The game is one of the best presented of its kind I have yet played on Android, and the brilliant method of using the online leaderboards is to be congratulated. 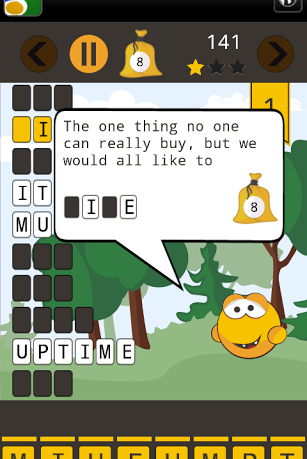 The game asks you to guess a range of hidden words, but the great thing here is that it gives you a series of clues for each word, which really helps to add to the puzzle element of the game. Have a few spare moments you do not want to waste by “killing” some fruits? 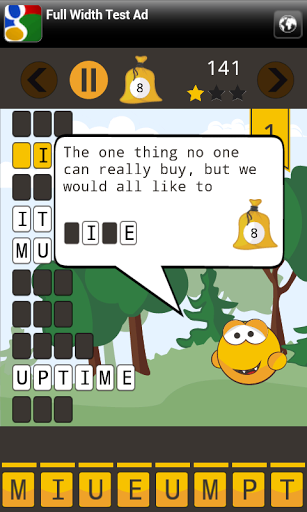 The game “Guess The Words” will not let your grey matter die out! Several hundred levels have been carefully prepared for you, each level with 10 to 20 hidden words. Guess a word and expand your vocabulary by having fun with any spare moment. Press letters and build words! Guess The Words does help to expand your vocabulary, and there are also hundreds of levels to play through. However, the feature I liked the best was the online leaderboards, as they show you how well you are doing compared with others by showing you what actual percentage of players you are in amongst. This really helps you find out how well you are doing, and is far better than standard leaderboards. Overall, this is a very decent game, and as it is currently completely free on Google Play, it is well worth picking up.